When the story of the body of a dead 25-ton whale found in a Utah field popped up in World News Daily Report a lot of readers must have overlooked the fact that the on-line publication specializes in satire and fantasy. That may be because the story appeared with a picture of the dead whale lying in an open field with a couple of men standing by. The story that broke in 2014 appeared in Facebook and immediately circulated the world as a true and unexplained phenomenon. It told how the police in Farmington were unable to explain how the giant whale made its way to the dairy farm of Michael Woodson, not far from the Great Salt Lake. They speculated that the creature may have lived in the Salt Lake and after it washed ashore, was transported to Woodson’s field as a prank. It is true that whales were introduced to Salt Lake before the invention of electricity by some enterprising characters hoping to make a business out of selling whale oil. It is believed that some whales still live in the lake. The idea that the animal was “dropped off” was dismissed, however, after police were unable to find any tracks in the dirt left by vehicles large enough to carry such a heavy beast. So the story was told. Even though World News Daily has been clearly known as a satirical publication, enough people believed the story that police dispatchers complained that their telephones were plugged that day with calls by people wanting to know more information. So where did such a story have its origins? It seems that a 33-foot-long whale did show up earlier that year in a salt marsh along the north bank of the Humber River near Skeffling, England. The dead whale was found about 800 yards from the water. Authorities believed the animal was carried ashore by an exceptionally high equinox tide that left it high and dry after the water retreated. The pictures that appeared in the World News Daily were obviously copied from the Daily Mail, which carried the original story. As it should be when highly intelligent creatures like whales perish under unexplained conditions, a postmortem was conducted by the Yorkshire Wildlife Trust and the British Zoological Society. It was determined that the victim was a female Sei whale. It was thought the animal was looking for food when the tide turned and it became caught. When the tide suddenly retreated, the whale was stranded. As it struggled it rolled over onto its blowhole and suffocated. Whales are mammals. 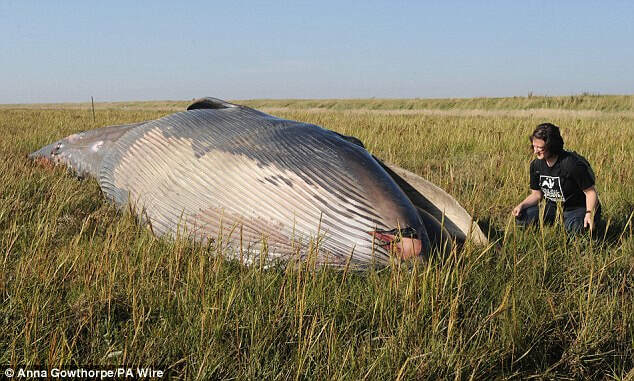 They breathe air like we do and this whale might have survived for a while if this hadn’t happened. It is not uncommon for groups of helpers to save stranded whales by collectively pulling them back into deep water.